Close and medium range engagements require lightweight, quick-to-point sights. The lean M536 provides a fast, clear aiming point in all light conditions and battlefield scenarios. An oversized, 36 mm objective lens gathers more light for a brighter image, 5x magnification puts rounds on target out to 700 meters, and the 10-setting illuminated reticle lets you instantly transition from close-quarter to medium-range targets, day or night. 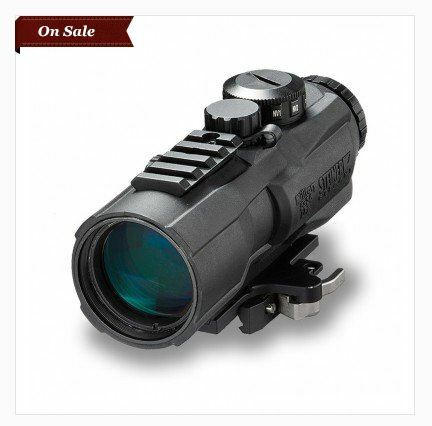 Close- to medium-range tactical sight with multi-coated 36 mm objective, 5x magnification, illuminated day/night ballistic reticle. Waterproof, shockproof, tough, and utterly reliable. 5X MAGNIFICATION for targeting out to 700 meters. MULTI-COATED OBJECTIVE LENS and Bak4 prism construction for sharp, high-contrast image. ILLUMINATED BALLISTIC RETICLE with 10 brightness settings for day/night operation. FULLY ADJUSTABLE up to +/- 60 MOA for elevation and windage. PICATINNY BASE on the top for mounting of an auxiliary sight for CQB operation. QUICK DETACH MOUNT adapts to any MIL-STD 1913 rail WATERPROOF submersible to 10 meters. TESTED to 1,000 Gs for shock and recoil resistance. POWERED by one CR2032 battery. REFURBISHED products may or may not include accessories.